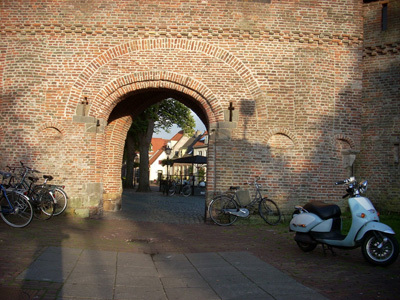 Today is the final day of the Netherlands leg of our Bike Tour 2009. As in days past, The Zeeland leaves port by 7:00 am, and we watch the country side slide by as we have breakfast and prepare for the day.Â We make it to the locks near Gem Nijkerk just before 9:00 am and we hustle off with our bikes so that The Zeeland can enter into the locks and continue on its journey back to Amsterdam.Â Today is a windy day up on the dikes in the northern flat lands along the water. From here we ride out past an old steam pumping station for a little exploring and a short break. There is a stone outside that says 1776. 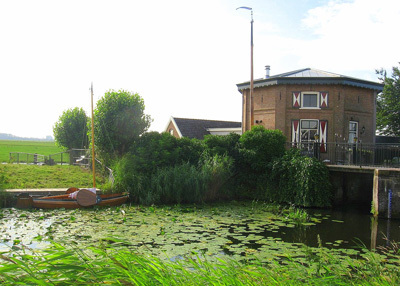 Hannameike suggests it was the location of a windmill before it became this steam powered station.Â And while the station is kept in working condition by a group of aficionados, this station has now since been replaced by a more dependable electric version.Â The station is used to pump the waters out of the lowlands, and back on the other sides of the dikes, in a continual vigilance to keep the sea at bay. The large chimney at the station is now home to some chimney swifts and we smile as we recall that a group of swifts had moved into our own chimney just prior to leaving home for this trip.Â Then back out on the windy flats as we make our way to our next ferry crossing.Â On the trip we have taken perhaps 4 ferry rides.Â I believe that there was a charge for each one, however I am not sure what those charges were since, Hannameike saw to it that the tour paid our ways.Â That included the museum and national park entry fees. Â That was convenient. Â We thanked her at this point for her efforts in getting us across but she explained much of her conversation with the captain centered around the torrential rains coming our way from Amsterdam. Wonderful. Â Having had rain centric conversations with this group in the past, Honey has learned from George that in Germany they say it is “raining elephants”, and at this point she repeats this back to him.Â To which he gazes out to the horizon, nods, and without saying a word pedals off down the path. Â Soon after the a heavy, stinging rain begins to fall and shortly after we are completely soaked, we can find some shelter for a moment, to regroup beside a tall hedge. 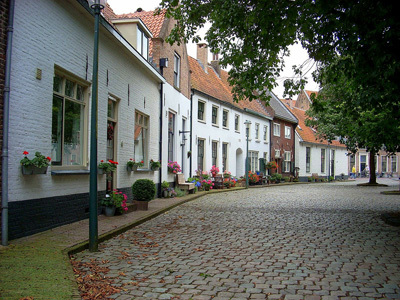 Then into the small town of Eemnes. In the center of the town is a small wooded park with this large brightly colored tent. That wonderful smell emanating from the tent turns out to be hot poffertjes and fresh coffee. Hannameike has delivered us to bike ride stop heaven. Shedding out dripping rain clothes we make way inside to watch the crew bake the poffertjes. They are served hot, smothered in powdered sugar and butter. I high sugar/fat treat to be sure, but after tasting one, you dont really care. The giant grill in this tent is capable of baking over 200 at a time, but the windy rains have served to keep the crowds down as there are perhaps only a dozen other people in the tent. 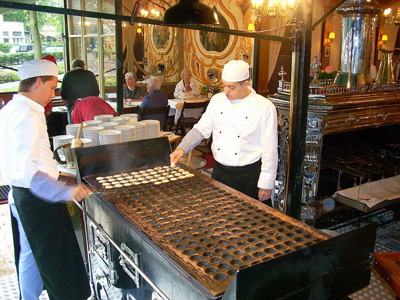 Poffertjes, it turns out, are a Dutch version, of Scandinavians aebleskiver, just a little flatter, and perhaps not as fluffy, since they do not whip the eggs. A real delight for us on this day. The restaurant/tent is a temporary structure here in the park, as they typically move on and are replaced later in the year by other types of prepared foods. The tent is erected around a very large tree that is being used as the center pole for the tent. 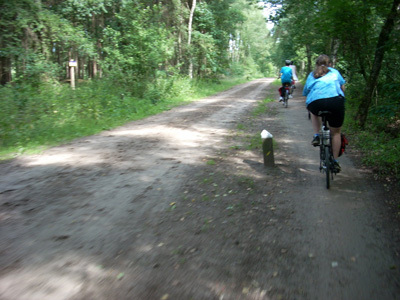 After getting our fill we ride on out using the sandy gravel roads that cut through the forests. Coming around a bend, the group comes to a halt as we see in front of us perhaps a dozen large longhorn steers standing beside the road on which we intend to ride. There is no fence between our group of bikes and that group of steers, so the next move is theirs. 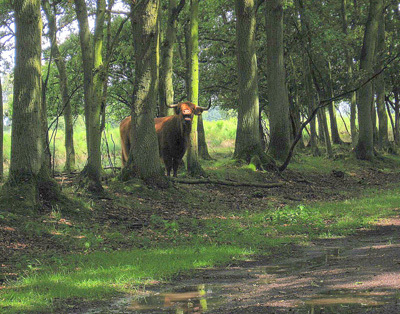 We remain still until they become bored with our presence and wander across the road in front of us and into the deeper woods, leaving one steer to stand watch over us. Soon even he begins to amble down the road just as two jogger are making their way up the road. They stop in their tracks perhaps 60 feet from the bull, and begin making their way quickly and unobtrusively over off the other side of the road, and behind some trees as he struts past them, on his way to join his friends. Interesting. It begins to rain hard again, and by now the group has gotten farther behind the usual schedule so we stop at a small park, short of our planned lunch stop in town, to again huddle under the trees to eat. This stop is by another war era fortress. Nearing the next town on the days ride, Nadia has fallen behind again due to a flat tire, so Hannameike and Monkey pedal back to repair it, with the rest of the group riding on ahead a few miles to the town in search of coffee. With the tire repaired the Hanameike and Monkey arrive to regroup at the restaurant as the others have finished and are now ready to ride on again. Nice. Then on through a town where we are stopped for a bridge opening, when a Dutchman jumps out of his car to track down Monkey to ask about the mirror on his glasses. Pleased to be able to get an explanation, and to try on the glasses for himself, they part ways again once the bridge is lowered and it is time for the cars to move again. Getting closer to Amsterdam and traffic is noticeably heavier. Monkey, having stopped on the path to take a bridge picture, and hears it from a trio of racers flying by in the other direction. Their words were all in Dutch, but, its pretty certain that they weren’t all nice words. The wind is picking up as well, and at one point while following directly Nadia it seemed to us that she actually went backwards. Too soon, we are back to the boat. The Zeeland is once again parked at the same spot that we found her just one week ago. After cleaning up the bikes and having dinner, the group walked into town for a canal boat tour. Then there was a little time to relax, organize our things and enjoy our last night on the boat. This entry was posted in Bike Tours on October 30, 2009 by golinielcomblog. 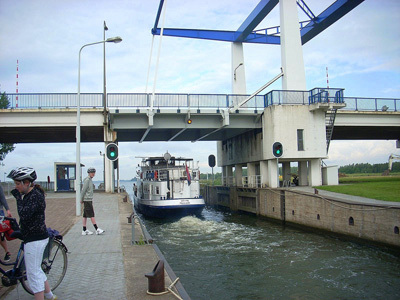 Â On this morning The Zeeland pushes off from the dockside of the Ijssel river, in Kampen,Â promptly at 7:00 am. 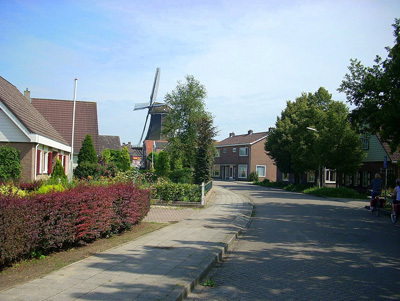 Headed northe, downriver to the Ketelmeer, and then southeast through the wide canals to Harderwijk. Today would be loop ride out and back in to Harderwijk.Â The boat cruised as we dressed, had breakfast, and then prepared for the days ride.Â I had enough time to get soundly thrashed by George in a game of chess.Â He began the game by admonishing me for my bad choices in opening moves, explaining to me the different opening gambits.Â It was at this very early point in the match that I knew I was in trouble.Â The boat soon docked in Harderwijk, on the outside of another cycle tour boat.Â This was one of several days that we docked against another boat, which required us to take our bikes off our boat, then across their boat and down to the dock.Â No on seemed to care, just business as usual on the waterways of The Netherlands. Â The early parts of the ride took us in to the National park lands again.Â A beautiful area to ride through, with lots of trees, which helped to some degree to shelter us from the torrential rains. At this point I began to ponder the wisdom of not installing fenders. Paul slipped off the roadway and fell to the pavement quite hard cutting his knee and bruising his shoulder.Â This was the second and last fall for the group. Â The rain fell quite hard for about two hours until we found shelter under the windmill in Ermelo.Â This windmill was a working grain mill, and we took a tour up through all four floors.Â There was a couple of workers there happy to show us all the intricacies of the mill.Â They demonstrated the braking system, the technique for re-grooving the worn stones, and how to winch the upper section of the windmill around in order to face the wind. Hannameike, our cycle guide released us for a 15 minute tour of the town, while she waited for us at the windmill.Â We promptly setÂ off to find coffee and pannekouken.Â Pannekoeken had quickly become a group favorite.Â Essentially an ample plate sized, thin pancake, embedded with something good, like apples, chocolate, etc.Â After a fair bit of time, spent with coffee, and hiding out from the rain.Â Hannameike was spotted riding through town in search of us, since we were once again,Â behind schedule.Â Soon the group mustered and we set off again.Â Paul, once again showing his unique lack of awareness, dawdled until we left, then went the opposite direction and promptly got lost.Â Another wait while Hannameike goes out and tracks him down. 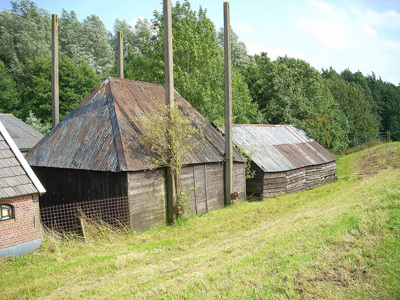 We saw many barn structures with tall poles, which allowed the owner to winch up the entire roof, I supposed to allow for feed storage. The rain finally cleared up about the time we got into Harderwijk at about 5:00Â Â Our dinner tonight was pasta, which finally made the Italian Nadia feel at home.Â After dinner we showered and walked around town as the sun set , somewhat saddened in the realization that the next day is the last riding day of the tour. 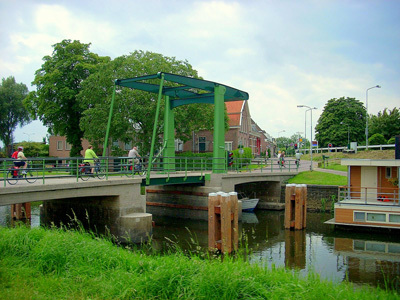 This entry was posted in Bike Tours on October 23, 2009 by golinielcomblog. On our latest trip to Louisville, I was once again able to sample the local foods.Â So, for lunch with Aunt Joan,Â it was the “Louisville Hot Brown”. A Hot Brown is a hot sandwich originally created at the Brown Hotel in Louisville.Â The Brown Hotel (formerly the Camberley Brown Hotel) is a historic 16-story hotel in downtown Louisville on the corner of Fourth and Broadway.Â The hotel opened in 1923 and was funded and owned by James Graham Brown, a local entrepreneur. 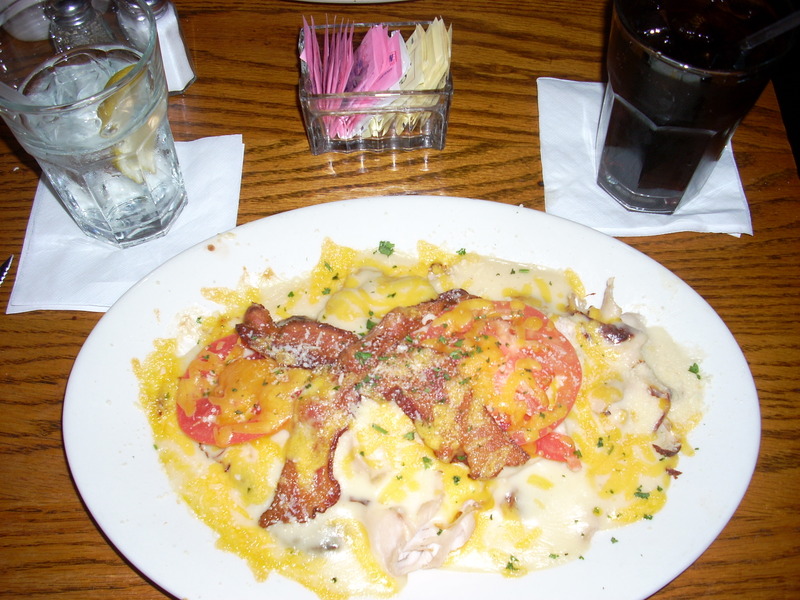 In 1926 the hotel chef Fred K. Schmidt introduced the Hot Brown sandwich, consisting of an open-faced “sandwich” of turkey and bacon smothered with mornay sauce, cheese and tomato.Â It has been a local staple ever since.Â On menus, the Hot Brown often appears as”Louisville Hot Brown”, or “Kentucky Hot Brown” or simply as “Hot Brown.” And the ingredients vary slightly from place to place.Â Â At KTs restaurant, all that turkey, sauce, bacon, tomatoes and cheese is piled on a croissant. Their menu shows this…. I doubt you can find the recipe on the weight watchers website, but I think if its just an occasional dietary extravagance it should be ok. This entry was posted in Social on October 23, 2009 by golinielcomblog. 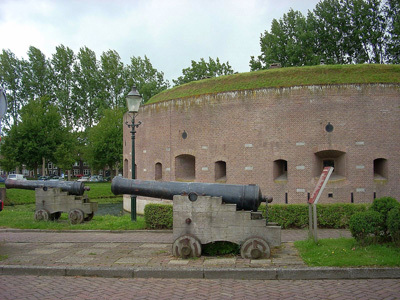 Netherlands Bike Tour – Deventer to Kampen, war time revisited. Day 5 of the tour and I am pleased to see that it is starting to dry out and warm up just a bit.Â Yet, the effects of the time change, the dietary changes, and living in the lower cabins is having a bit of an effect with Honey and just prior to departure, we decide it would be a good rest day for her so she can be stronger for the rest of our trip.Â The rest of the group disembarks and to begin our ride just after breakfast.Â One mile in to the ride, Hannameike discovers her bike wont shift out of first gear, which causes a half hour delay as we repair her shifter. 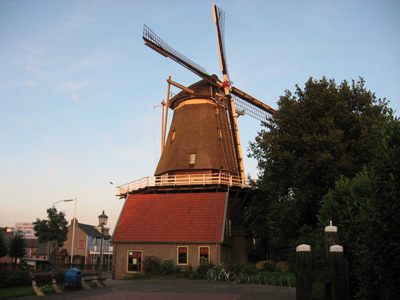 Once underway, we wind our way up through the towns of Diepeoveen, Olst, Wijhe,Â and Hattem, in a Northerly direction following the river Ijssel up to Kampen. HattemÂ was the largest town of the day, and this is where we stopped for a stroll through the town.Â With time to tour the Hattem reformed church, built in 1455, it is in remarkably good condition.Â George, Lena and IÂ sat on street side benches behind the church to relax with our lunch. After every one had their time to stroll, and shop, and of course, have some coffee, we were off again. 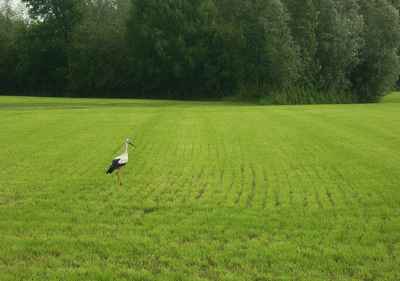 In the fields we often had occasion to see some storks.Â Its the closest I have been to a wild stork. There is still much evidence of the effects of the war, on the countryside of The Netherlands. 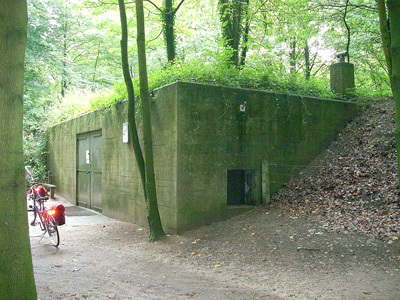 Here, we stopped at a concrete hillside bunker that was built as a hospital. On this day, we passed two placements along the road that were essentially tank cannons mounted in concrete. Hannameike took us on another slight detour through the forested gravel paths to an area that was to be filled with earthen dams, that would flood a very large open section of the countryside, turning it into an impassably marshy land, with the hopes of preventing the Russians from attacking. Then it was on to Wijhe, we we could again their windmill, and stop for coffee. 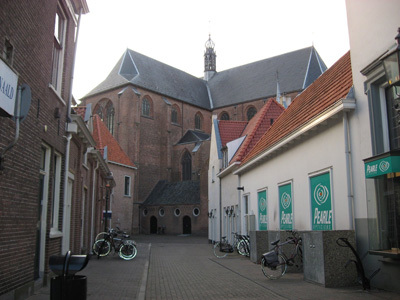 We got into Kampen a little after 5:00, where Honey was waiting on the top deck, and having rested and read an entire book she we feeling strong once again. 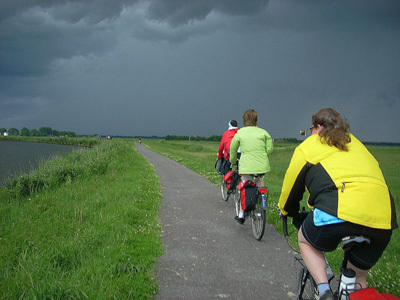 This entry was posted in Bike Tours on October 12, 2009 by golinielcomblog. The route today was slightly changed from the original plan of taking a loop tour out and back in to Zutphen.Â Today we ride on to Deventer. As always, the breakfast bell rings at 8:00 am and we all head up to the dining hall.Â For each breakfast Linda provides us with an array of choices. Â Several cereals, yogurts, fruits, breads, cheeses, juices, hard boiled eggs,Â and coffee.Â After breakfast, we then make our sack lunches from the remaining items, gather our gear and get the bikes off the boat.Â On this morning we are off the boat at 9:00. Â A pretty warm day, with no rain.Â A very comfortable day to ride. 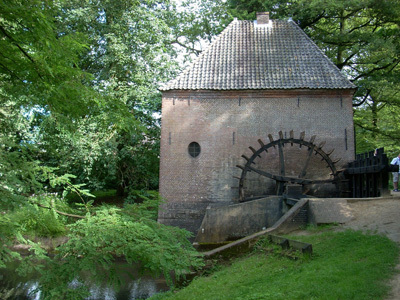 Our first stop is in a wooded area, accessible on a gravel road, to an old grain mill near Hackfort. It is fairly well maintained but apparently not still in operation.Â These days its use seems to be more of a venue for shows.Â We stopped to watch a crew work on the light and music system supporting a amphitheaterÂ that overlooked the mill pond. From Hackfort, we travelled more gravel roads and paths, or narrow paved roads with very light car traffic.Â Some of the paths are hard packed gravel that are fairly easy to ride, but others feature a deep sand or pea gravel base that proves to be difficult to navigate at times, particularly when the are soggy or soft.Â These areÂ not Honeys favorite surfaces to ride, but the wide Marathon Slick tires of the Bike Fridays, plus their low and stable center of gravity, make it significantlyt easier than our conventional road bikes. Â Today’s ride also featured the biggest climb of the tour, that Hannamieke had warned us about yesterday.Â The climb was on a single track path through a damp and dark forest, that lasted about a 1/4 mile and climbed perhaps just 200 feet.Â By this point it was obvious that this tour would not be about climbing. Then emerging from the forest we arrive at the Castle at Vorden. 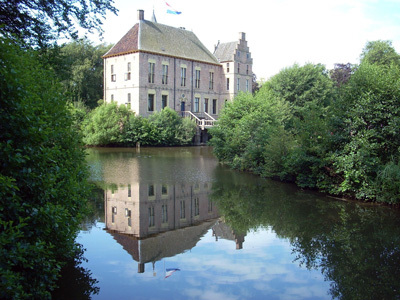 The Dutch versions of Castles are not the same versions as those in France and in Denmark. But, as in France, they mostly appear to be privately owned, and few are ever open or accessible to the public. This one does not appear to be in use, but I am certain it is not forgotten or neglected.Â Then off through the countryside, stopping again at the numerous tiny little towns for a coffee break. 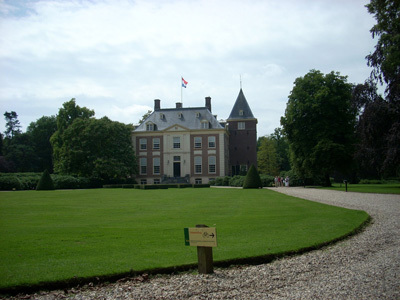 We stop at the Mansion Verwolde, near Laren for lunch on the grass. Afterwards we wander about the gardens until the time comes for our hour long guided tour of the interior. This was at one time a very large property, owned for decades by a land baron family, and they seem very proud of its history. It also served as a hospital during WW II. 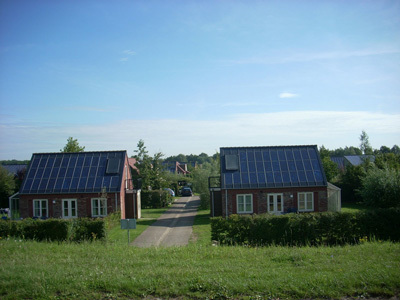 Along the paths we passed a small subdivision of identical homes that were all equipped with solar panels. All the stops made this a full day of riding. The approach to townÂ today was pretty crowded with much car and bike traffic, and we arrived in Deventer, to find The ZeelendÂ docked on the shore of the Ijsse, waiting for us.Â With just enough time to take care of the bikes and equipment before dinner, with baked salmon.Â Then showers, some quick taxi arrangements for our transportation through Paris later in the week, then a walk through the town of Deventer.Â I very nice town, but like most towns here, with the exceptions of the pubs and restaurants, no other businesses seem to remain open after dinner.Â I would guess due to the long days on the bikes, we were in no more than 4 stores the entire time 11 days we were in The Netherlands. 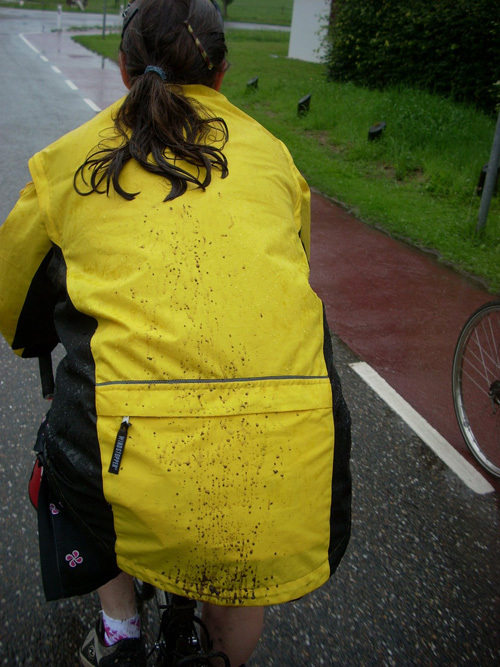 This entry was posted in Bike Tours on October 8, 2009 by golinielcomblog.